All right, ya goldbricks! Stand at attention and salute the good Sgt. Fury and his latest cache of World War II adventures brought to you by none other than the MARVEL MASTERWORKS! Your mission includes action on the Greek front, covert operations inside Berlin, incursions into Rommel's North African territory and a rendezvous with the French resistance - and that's just to shake the dust off. You'll also read the Howling Commandos' origin, meet a new member of the group in ex-Nazi Eric Koenig and face off with Colonel Klaue's crack Blitzkrieg Squad. It's war action in the mighty Marvel manner - so report for duty as requested, or it'll be permanent K.P. duty. Dismissed! Collecting SGT. 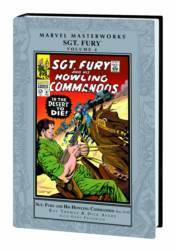 FURY AND HIS HOWLING COMMANDOS #33-43.